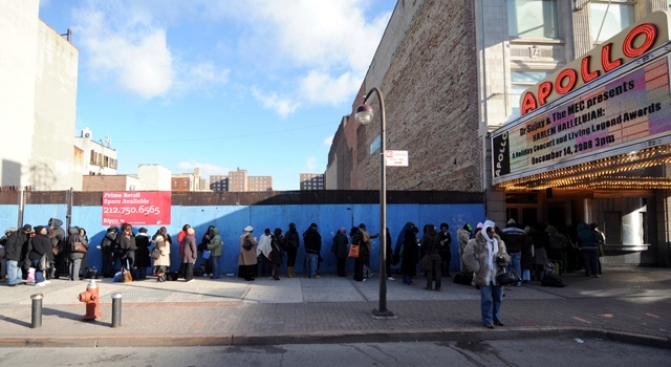 The Apollo Theater celebrates its 75th anniversary on June 8. The Apollo Theater will celebrate its 75th anniversary by inducting music impresario Quincy Jones and R&B artist Patti LaBelle into its Hall of Fame. The June 8 anniversary gala concert will benefit the landmark Harlem theater. The Apollo also will present its arts and humanitarian award to Bill Cosby and his wife, Camille. Previous recipients have included Denzel Washington and his wife, Pauletta, and Spike Lee and Tonya Lewis Lee. The award is named after Ruby Dee and Ossie Davis. The lineup of performers for the evening include actor/comedian Jamie Foxx, singers Mariah Carey and Anita Baker, and the R&B group O'Jays. The Apollo is fabled for propelling the careers of Ella Fitzgerald, Billie Holiday, Stevie Wonder, James Brown and others.